This family activity program is designed to teach proficiency in a variety of life skills for the purpose of developing well-rounded young men and women. Highly recommended! Theater, Astronomy, Architecture, and Swimming are just a sample of Achievements in five categories, or "Paths," designed to reflect our own pilgrimage toward our Heavenly Father. Each completed path forms a step named after the five pilgrimage sites of the Middle Ages: Canterbury; Cologne; Compostela; Rome; Jerusalem. 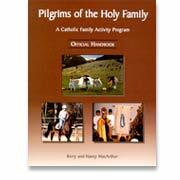 When two-thirds of the activities in a path are completed, participants advance to "Canterbury Pilgrim." After completing two paths, they advance to "Cologne Pilgrim," and so on. There's no "right" order to the completion of activities in any one subject area. This flexible program was designed to accommodate a variety of approaches. This ideal enrichment program is a family-focused, Catholic alternative to scouting and 4-H.
Pilgrims of the Holy Family can also be utilized for physical education. Over half the activities in the Woodsmanship Path would be suitable for this purpose: for instance, Athletics, Cycling, Hiking, Physical Fitness, and more. High-quality badges are available to encourage, motivate, and reward.